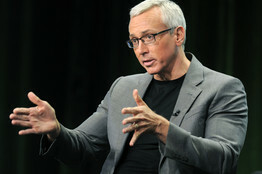 CNN Headline News host Dr. Drew Pinsky is in a bit of a pickle about his past. The Wall Street Journal reports that back in 1999 the TV doc extolled the virtues of GlaxoSmithKline’s popular antidepressant Wellbutrin to his Loveline radio audience, saying he prescribes it and other medications to depressed patients because it “may enhance or at least not suppress sexual arousal” as much as other antidepressants do. The info was uncovered this week in a complaint filed by the U.S. government in federal court last October against the pharmaceutical company. The documents were disclosed as the U.S. Justice Department announced a $3 billion criminal and civil settlement with Glaxo over illegal drug marketing and other matters. Doctors can prescribe drugs however they see fit, but it is against the law for companies to promote drugs for uses not approved by the FDA. Wellbutrin’s label doesn’t say anything about its sexual effects one way or the other.